The Vaima Polynesian Bar and Restaurant is set RIGHT ON THE BEACH on the South side of the Island of Rarotonga, in the village of Vaimaanga, in the district of Titikaveka. Bar opens at 5pm offering local and International beers and of course, our famous Vaima Cocktails. Your hosts Cameron and Dorothy Robertson are originally from the Isle of Arran, Scotland. 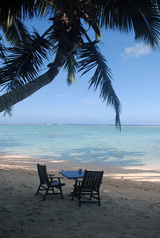 During a holiday in the year 2000 we visited Rarotonga as a Pacific stop-over on the way to New Zealand. We were instantly taken with the island and the culture and made a decision to return to the island and make Rarotonga our home. The following year, 2001 we traded our hotel and restaurant in Scotland for a backpackers in Arorangi called Atis Beach Bungalows. Over the next few years we re-developed the property into Castaway Beach Villas. With a lot of hard work, dedication and lots of help from staff and friends the property became a great success within the industry. We received a good offer and decided to sell the property to a group developer in 2007. During the time we were involved in Castaways, we met some really fantastic people who are to this day, our dear friends. After a period of time we were involved in Aquarius at the airport for 18 months. Under our management we revitalised the property which was really doing well but due to personal reasons decided not to renew our contract. When the Vaima Restaurant, just along the beach from our home, came up for sale in 2010 and after months of negotiations, we finally completed the purchase in June 2010. An anagram of Rarotonga is � Go to Arran!!! !